The American Academy of Pediatric Dentistry recommends that all children have a dental home--which refers to the ongoing relationship between the dentist and her patients--by no later than age 1. A dental home is important because it allows for children to receive comprehensive care in a coordinated, easily accessible, family-centered manner. The most important reason to establish a dental home early on is to begin a thorough prevention program. The American Academy of Pediatric Dentistry recommends a dental check-up at least twice a year for most children of all ages. A tooth cleaning removes debris that builds up on the teeth, irritating gums and possibly causing cavities. Fluoride treatments renew the mineral content in your children's teeth, strengthening them and helping to prevent cavities. Hygiene instructions improve your children's brushing and flossing, motivating them to take responsibility for a healthy smile. Dr. Hayder knows how to soothe and make my daughter feel comfortable, and actually enjoy going to the dentist. She is also very disciplined in dental care, which I feel is very important. Because of Dr. Hayder's instructions, we've been diligent and proactive in preventative dental care. 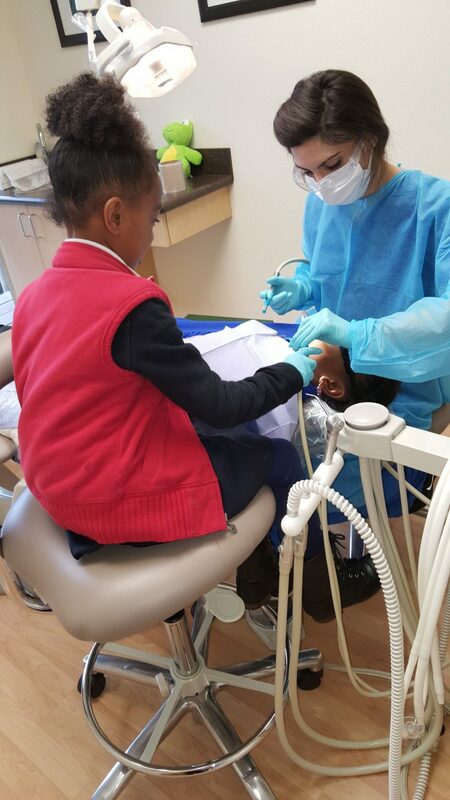 We appreciate her ability to combine her soft skills with children, and her disciplined skills about dental care. Will Dr. Hayder take radiographs at every check-up? Not necessarily. Dr. Hayder acts in strict adherence to the guidelines of the American Dental Association and the American Academy of Pediatric Dentistry, which require dentists to determine whether radiographs are indicated based on each individual child's need. Radiographs may be needed to check for cavities or in preparation for orthodontic treatment, for example. Dr. Hayder uses a variety of techniques to help guide children through treatment. We rely on such techniques as distraction (engaging children in conversation or playing a movie during treatment) and tell-show-do (explaining and showing children what we'll do in a child-friendly manner). We also rely heavily on modeling--allowing younger patients to watch their older siblings receive treatment--in order to help children feel more at ease. We also offer nitrous oxide/oxygen, a safe and effective sedative agent used to calm a child's anxiety and to enhance effective communication. 1) Dr. Hayder does not like to medicate unless absolutely necessary. Sedation is safe, but she wants to prevent cavities and wants the least invasive procedures. 2) Dr. Hayder works well with children. My children love to ask questions. She pays attention to them and knows their personalities. 3) She works at our comfort level and explains every procedure herself. She recognizes our concerns and addresses them immediately. A check-up is also an opportunity for Dr. Hayder to evaluate the growth and position of the teeth and jaws. The early diagnosis of any developing malocclusions--crowded or crooked teeth or bite problems--is important, and we can intervene to guide teeth as they emerge in your child's mouth. Early orthodontic treatment can help avoid more extensive treatment later. Dr. Hayder is on 24-hour emergency call. Children often injure themselves in the oral area when they are first learning to walk or, when older, while playing or during sports activities. Dr. Hayder is available to address any injuries to the teeth or other parts of the mouth at any time. If your child has an emergency outside of normal business hours, please call our office at the phone number above and listen for Dr. Hayder's after-hours contact information on our message.